Russian President Vladimir Putin (front) delivers a speech at the Russian Energy Week 2017 forum in Moscow, Russia October 4, 2017. MOSCOW - Russian President Vladimir Putin said on Wednesday he had not yet decided whether he would run for re-election in March 2018, something he is widely expected to do. “Not only have I not decided yet who I will stand against, I have not decided whether I will run at all,” Putin said, when asked who he would run against at the election. 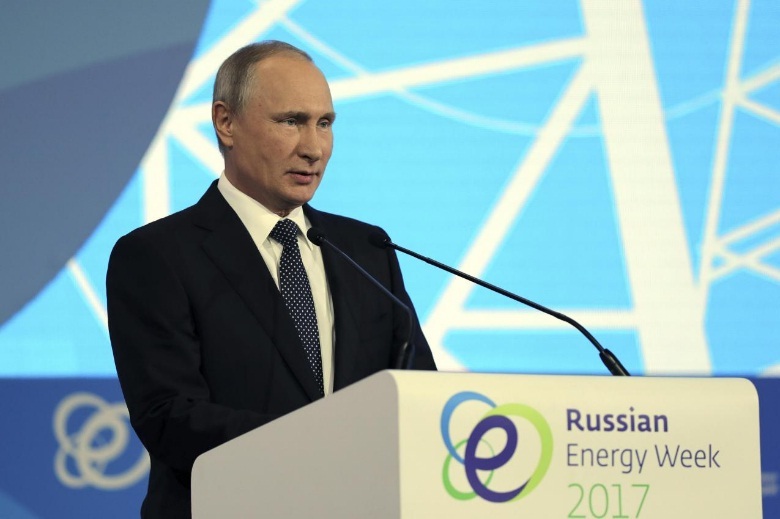 Speaking at an energy forum in Moscow, Putin said presidential hopefuls would have to announce their decision to run in late November or early December. If Putin decides to run, he is widely expected to win a landslide victory in the first round of the vote, because he will face no strong challenge. A Russian court sentenced opposition leader Alexei Navalny to his third jail term this year on Monday, disrupting plans by the long-time outspoken Kremlin critic to campaign before Russia’s coming election. His current 20-day term in jail means he will miss a campaign rally planned in Putin’s hometown of St Petersburg on Oct. 7 - the Russian leader’s birthday. In any case, opinion polls show that Navalny would lose badly to Putin if he ran. The Kremlin on Tuesday warned supporters of Navalny not to hold unsanctioned rallies, saying the organizers of such events would be prosecuted. Russian President Vladimir Putin said on Wednesday he had not yet decided whether he would run for re-election in March 2018, something he is widely expected to do.